who rides in the winter LOL? come on greg you never try to ride in 2 feet of snow? so they have different fuel in the 70 degree winter? 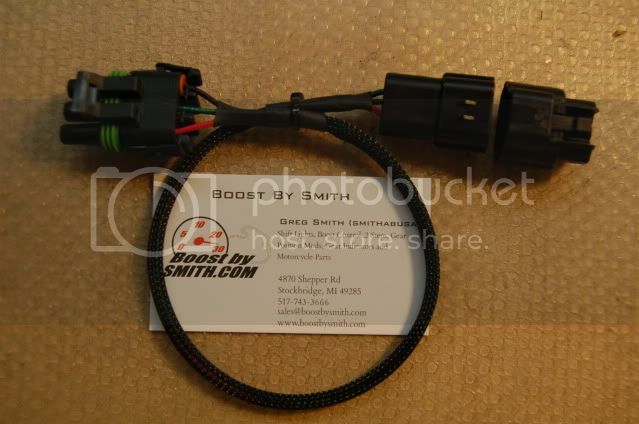 I am pretty sure this is the mating connector to the map sensor. LOL gotcha, been a LONG LONG day, going to bed now. Thinking about adding Psi/Kpa display on the boostfuel module and possibly also map tracing so that when tuning starts the tools will be avail soon too. The boost enrichment map is now calibrated for gm3 bar sensor using voltage conversion formula and pressure tables found on internet. Also tracing bug is fixed, now the boost gauge on boostfuel module page should show correct boost in both psi and kpa depending on ecu type. How does these default limits sound ? Under nomal engine conditions the sensor errors make the FI light stay constantly on. If boost or AFR limit exceeded the Cxx errorcode will display C00 and these will not show on ecueditor DTC list. Boost and AFR adjustable. The positive pressure limit I would like to keep fixed just for simplicity. May need to add TPS>50% or something in there. Yes, higher TPS would be good to prevent lights from a pressure surge from snapping the throttle shut, even if there is a blow off valve, may stilll spike a bit. Currently it runs 10Hz cycle, but can be programmed to run any reasonable solenoid controlling speed. Connect the TX line from ECU to a transistor that drives the mosfet. TX line is the same to which the yellow FTDI connects. I suggest building this to an yoshbox plug, even though one needs to remove it for flashing. Same harness should be usable for Nitrous Control solenoid too. It provides +5V if nothing is connected. Boost controller firmware pushes the line to 0V when solenoid is to be closed, and to +5V when solenoid is to be opened. Here also visually how it works. I.e. when boost pressure increases the duty cycle of the boost pressure control solenoid is increased. That way the pressure control solenoids leaks an increasing amount of pressure until the pressure starts to drop again and hence should maintain the desired pressure. Same but other way round happens when boost pressure is decreasing. Megasquirt uses the schematic below for boost controller. It may work as it is with busa ecueditor boost controller, depending on how much current is needed or it may need one additional switching transistor before the 100R resistor. This is to be connected to to the TXd0 pin of the ECU - i.e. same pin to which the yellow FTDI cable wire connects to. EDIT - The way how this can be implemented could mean that the duty cycle needs to decrease to prevent boost being "flushed" into intake. Anyway when someone wants to start experimenting with this we can decide if the duty cycle is used for "flushing extra pressure from actuator line" or if it is used for "allowing pressure to enter the actuator". I responded on SH.org, not fully understanding that you alrady have a closed loop system. This looks as if it should work wel, provided frequency response is "tuned" to the solenoid used and the system is not underdamped (always chasing the target), although with your increasing and decreasing dutycycle modulation, it may be good to go. I believe most bike applications woudl just vent to atmosphere instead of back into the intake as there is no Mass Air sensing. Venting pressure is likely better than adding pressure as adding will require a small bleed (controlled air leak) in order fo rthe actuator to close again. This should work ok for a single port wastegate application. Just curious, is thee a possiblity to drive more than one solenoid using the YOSH connector or just one Output? If more than one, perhaps a two solenoid, increase / decrease system could eventually be developed. no, did not have a closed loop until you mentioned about it. Took about an hour to modify the nitrous style open loop control to closed loop. As said, not really difficult. The way I see this without understanding the turbos much, there is two different methods. I quite like this first one because of possibilities it gives, but guess that many are more familiar with the second one. Comments to these alternate controlling methods ? 1) Pressure control with venting ? 2) Pressure releaase control ? As I dont really understand turbos, why would there be a need for two controls. Could someone throw a picture and explanation ? When a 2 port wastegate is used, a pressure chamber exists both above and belos the diaphragm. Also a spring below the diaphragm to keep the gate shut. The 2 port gate allows additional boost pressure to be applied to the top of the diaphragm, essentially increasing the spring pressure and holding the wastegate closed. This allows a small spring to be used to allow low boost for launching or lower gears, and then as much additional pressure as desired on the backside to increase boost to whatever is desired. Can be done to a limited extent using only manifold pressure, but is common to use an external air supply in racing to be able to put whatever pressure is desired at any time. The "increase" solenoid adds pressure to the backside of the diaphragm while the decrease solenoid vents it. They work (pulse) in conjunction with each other to maintain a set, closed loop pressure on the backside of the gate, leaving the "front" (opening) side of the gate connected to manifold pressure to open the gate. THis is the plumbing schematic for the AMS 1000. But, thats a STAND ALONE system? Is this kinda control even possible with a Stock ECU? Do you mean that venting is not fast enough or is this purely an issue of spring force vs. manifold pressure ? It is possible to have more signals out of the gen2 ecu, but at this stage would rather concentrating on making this work and tweaking the fuel, boost and ignition using ecu and utilize e.g. ignition for better torque under no boost conditions. This morning had some time to think about ignition control and that may be even easier than earlier thought of. The current idea is to have a boost/ignition retard map being added, or maybe just a formula .e.g. 3degrees/14psi and everything above and below linearly. Comments to this ? What about intake air and clt temperatures ? After we have this working will divert to nitrous control. Everything thats done for turbos will help with nitrous. I agree that the linear would be ok, however, it may be better to have a step function, i.e. no retard until a set psi, then a linear retard. ok - lets see what is easiest to start with. btw - received a gm 3bar sensor, partno 12223861. Suzuki to gm 3bar relation varies by voltage.There is a 0.7V offset with suzuki sensors compared to gm 3bar and then when using divider of 1,85 we get the gm3 bar. No wonder that the fuelling using GM3 bar was somewhat off.